Having some contemporary and reliable microphone preamps are a must for any recording studio but for those willing to take a chance on some older gear, the results can be down right thrilling! The Aphex company, long known for their affordable and utilitarian recording gear, made some terrific gear in the ’90s. 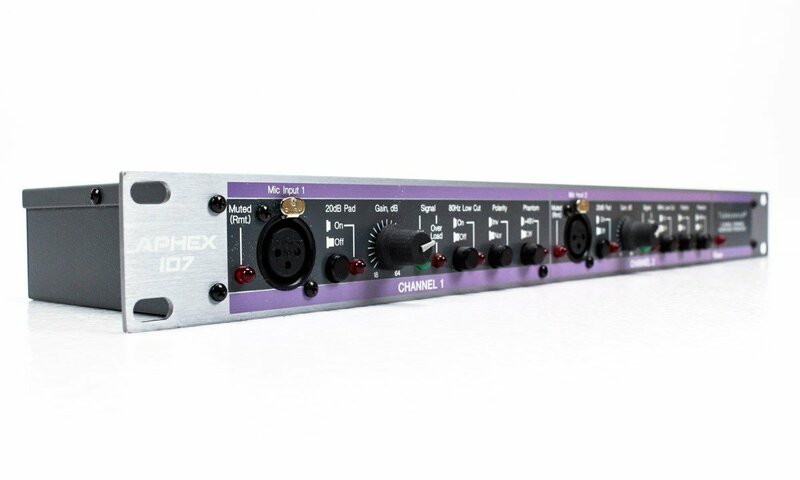 The Aphex 107 is one of those very cool preamps. A two channel affair, with the typical layout of gain, phantom power, phase reversal, 80hz low cut, 20 db pad with two led lights for channel signal and overload. As with any older gear, best to replace electrolytic and any power filter caps and clean the gain pots and push buttons to increase reliability. Having said that, I have found gear of this age that performs with no noise or problems whatsoever. Unfortunately in the studio, while recording the perfect take, is not when you want to find out it needs a little maintenance! This preamp is tube driven so you can use those cool old Telefunken or Mullard 12axt tubes you bought on Ebay awhile back. I have two of these preamps for four channels of fun and I never seem to be disappointed with the results. They seem to stay quite clean in the output when pushed. While not a power house the output gain is respectable and predictable which is wonderful. I have also used these as an instrument direct In, with great results. These preamps are still found in auctions and if you are patient, at crazy low prices. I have some higher priced spreads in the preamp rack that I can use but I find myself always checking to see if these are appropriate for me to use because they always seem to add some electron magic to the party!